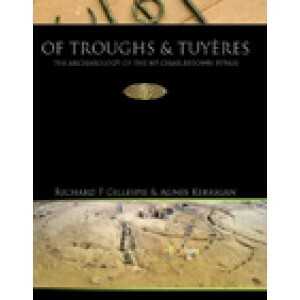 Of Troughs and Tuyères presents the results of more than forty excavations carried out before construction of the N5 Charlestown Bypass. Pre-development route selection avoided known archaeological sites. Initial small-scale test excavations determined areas where full resolution of all potential archaeological sites was required. Archaeological work on the road scheme has allowed for an exploration of six millennia of human activity within a relatively ordinary landscape. The results are remarkable and highlight the potential of a landscape where monumental remains do not indicate the full extent of human activity. Work at Sonnagh townland uncovered Early Neolithic roundhouses, pre-dating the well-known site at Ballyglass. A cluster of extremely well-preserved Bronze Age fulachta fiadh was also uncovered in Sonnagh, and finds included a tin bead perhaps imported from as far away as Switzerland. A previously unknown archaeological complex site at Lowpark townland included Neolithic pits, a Grooved Ware timber circle and early medieval enclosures. The enclosures are unusual in the Irish archaeological record as they were split-plank timber palisades, constructed sequentially. Evidence for repair of the palisades and contraction of the settlement sites was also recorded. Lowpark has provided a unique record of the technology of ironworking in the early medieval period, with the discovery of three semi-underground iron workshops and artefactual remains including anvils, tuyère fragments and almost one-and-a-half tonnes of iron slag. The excavation at Lowpark has also provided secure dating of souterrains clearly showing their construction period in the sixth and seventh centuries. The archaeology of the Charlestown Bypass includes many other sites, ranging from the Neolithic to vernacular 19th-century buildings. Specialist reports on the findings have reconstructed past landscapes, indicated contact with the wider world and provided great insights into past technologies and crafts. This book brings the results of the excavations into the public realm. It provides source material for future archaeological researchers, adds greatly to our knowledge of past activity and the exploitation of the locale in prehistoric and historic times, and records centuries of interaction between people and the landscape.